In case you missed it, Harvard has been busy quietly fighting Trump’s plan to tax the money it earns by throwing around its $36 billion political muscle. Sorry, I mean to say endowment. Now that’s draining the swamp! Newsflash Drew: A lot of people and organizations have investments “at work in the world” but still pay 15 percent capital gains tax, way more than the 1.4 percent being proposed for Harvard’s annual earnings. On top of that, unlike Snowflake U, the vast majority of those investors aren’t using their proceeds to lobby in D.C., and they certainly aren’t keeping political prisoners like Harvard has been, let alone on the taxpayers’ dime. Video courtesy of Reverend Patrick Mahoney's YouTube page. And keeping political prisoners isn’t cheap. Estimates of the tax funds paid to Harvard-affiliated Boston Children’s Hospital (BCH) for medically kidnapping, paralyzing and torturing Justina range from $500,000 into the millions and those estimates don’t count all of the tax money wasted by various government agencies and the courts by playing defense and shielding Snowflake U from melting under the heat of the media spotlight. Maybe instead those costs should be deducted from the $225 million BCH receives every year from the federal government or from its $2 billion in other untaxed assets. As for me, the U.S. marshals in the District of Massachusetts have been paying the astonishingly corrupt Plymouth County Sheriff Joseph McDonald Jr. over $100/day to hold me because I defied Harvard by trying to save Justina’s life. Maybe they could send the bill to Harvard’s 54-person panel on “inclusion and belonging,” and perhaps, if they weren’t too busy dealing with a multitude of other scandals, they would. If they did, it would be another first for the university, making it the only school in America to pay for keeping a political prisoner. 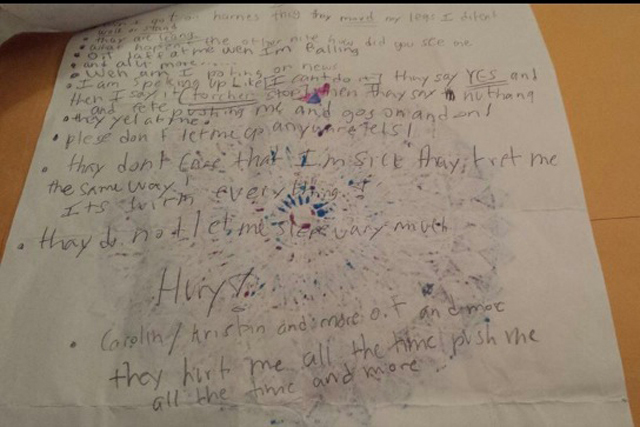 “They hurt me all the time” – Justina Pelletier’s secret note that she smuggled to her family while she was held against her will in a Harvard-affiliated psych ward. Of course though, keeping political prisoners isn’t very politically correct. It’s even less PC to imprison me for stopping Harvard’s pediatric teaching facility from torturing an innocent child. Which gives me an idea. Maybe we’re going about this the wrong way. Perhaps, if we taxed Harvard on its hypocrisy instead of its endowment, we could take care of that rising student debt and those soaring tuition rates. What do you think?